The M109 is a self-propelled howitzer on a tracked chassis that first entered service during the Vietnam war. The initial system is based upon the M126 155mm L/39 main gun mounted in a traversing turret for greater operational flexibility. 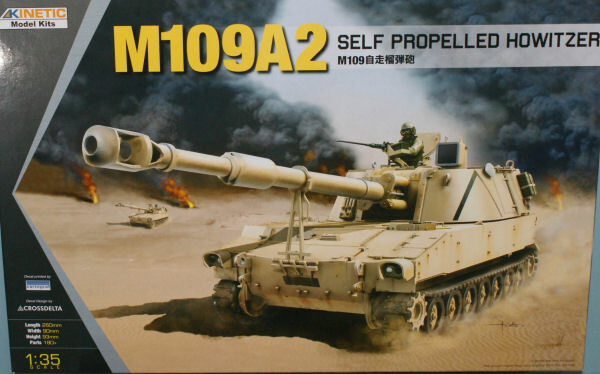 The M109A2 upgraded the main gun to the M185 along with some engineering updates to improve operational reliability. The M109 remains the primary tracked artillery system with the US Army and the current configuration is the M109A6. The M109 has seen service with numerous allied armies though some of these have replaced their M109s with more capable systems. Kinetic has released their second armored vehicle in 1/35 scale, the first being the M-ATV (reviewed here). This kit is molded in tan styrene and presented on seven parts trees plus five additional parts trees molded in black. Duplicate parts trees are not shown in the images to the right. The kit is designed to be a simple build but still provides some nice exterior detailing. The kit doesn't have an interior and the rear access hatches are molded closed. The commander's hatch is positionable but you'll need a figure in that hatch if you do opt to leave it open as there's nothing to see inside. The track sections are interesting as they're a combination of individual track links for rounding the ends of each run and sections of track links for those areas that remain flat. For those that prefer 100% track links, Kinetic has a detail set available for this kit for that purpose. Unfortunately my sample did not include the decals so we don't have an image of the sheet to show you. This is a another nice release from Kinetic and the tooling may render us more variants of this gun system in our future. This kit should be available soon at your favorite hobby shop. Better yet, this kit is available at only $35.99 from LuckyModel.